Hello! Today I’m sharing 5 cards created for the February 2019 Card Kit of the Month. 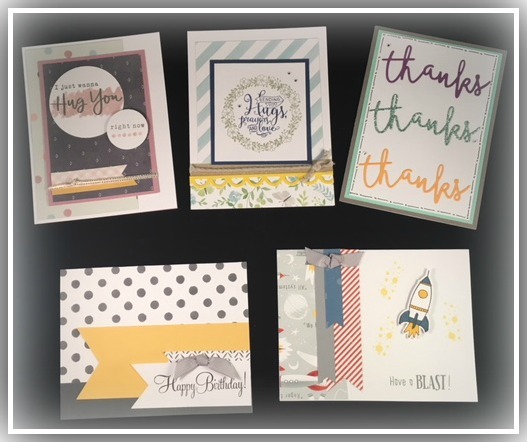 I love the challenge of creating a set of cards with amazing Close To My Heart products each month. The February kits are now here! (Available February 1-28th). January’s kit was a great hit so grab February’s kit while they are still available. There are a limited amount of kits available. US shipping included in the $15.00 cost. Each month’s Card Kit of the Month comes with 5 completed cards and 5 envelopes. I love challenging myself to make 5 cards from super simple and quick cards to more detailed designs. There’s something for everyone in this kit! All you need to is sign, attached a postage stamp and send. No assembly required! Contact me for your kit today. Paypal accepted.